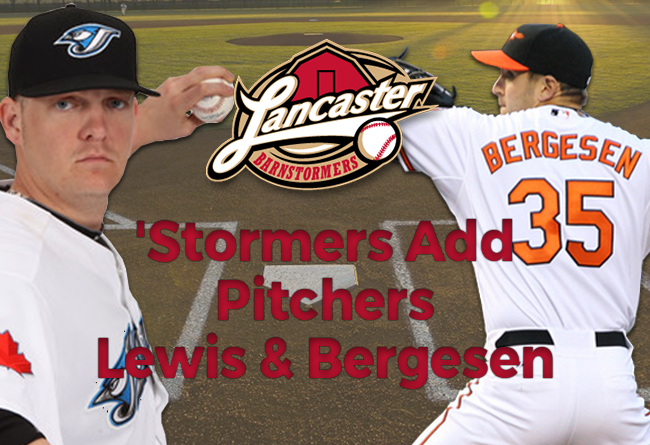 (Lancaster, Pa., Feb. 28, 2017) - The Lancaster Barnstormers have signed former Major League pitchers Rommie Lewis and Brad Bergesen to contracts for the 2017 season, it was announced today by manager Ross Peeples. The signings bring the total number of players under contract for 2017 to 16 and the total number of pitchers to seven. Lewis, now 34, signed with the Baltimore Orioles in 2001 and saved 25 games for Class A Delmarva in 2002, his first full season as a professional. The following year, the Orioles made him a starter for Class A+ Frederick. After working eight seasons in the minor leagues with the Baltimore Orioles and Toronto Blue Jays organizations, Lewis reached the big leagues in 2000, appearing in 14 games for the Blue Jays late that season. He returned for six more appearances for Toronto in 2011. Lewis joined Bridgeport in 2012 and moved to York in 2013. Over three seasons out of Atlantic League bullpens, the Seattle native went 6-3 with 40 saves and a 1.92 ERA. He was a season-end league All-Star in 2012. York converted him to a starting role in 2015, and Lewis responded with a 10-10 record and 3.86 ERA. He threw a five-hit shutout against the Barnstormers on June 7 of that season. Bergesen, 31, signed with the Orioles in 2004. The right-hander won 15 games for Class AA Bowie in 2008, the year before he earned his first promotion to the Major Leagues. The California native notched a 7-5 record and 3.43 ERA in 19 starts for the Orioles in 2009. He won his big league debut against the Chicago White Sox on April 21. He went 3-0 in June with wins over Seattle, Atlanta and Washington. All three victories came at Oriole Park at Camden Yards. Bergesen recorded 11 quality starts overall in his rookie season. He went 8-12 the following year, pitching a complete game, two-hitter in a 3-1 win over Cleveland on August 11. In 2011, his final year with the Orioles, Bergesen fired a shutout on May 14 at Tampa Bay. His last work in the Major Leagues came with Arizona in 2012. Bergesen pitched for the Chunichi Dragons in the Japanese Central League in 2013 and joined York for 10 relief appearances in 2015, posting a 3.24 ERA. “We believe that both of these veteran guys can come in and anchor our rotation on the field and be leaders in our clubhouse as well,” Peeples added.